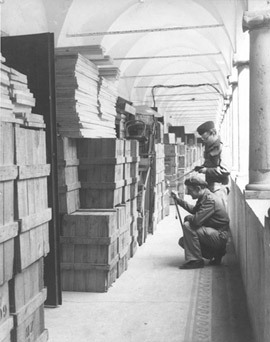 In May 1945 British soldiers discovered the storeroom used by the Zentralbibliothek der Hohen Schule in the Tanzenberg Monastery in Carinthia. The library's holdings consisted primarily of stolen books. The Stiftung J�disches Museum Berlin may not be held responsible for the contents of the pages linked to it nor for the contents of the pages it links to. Should rights (also) lie with others, please inform the Stiftung J�disches Museum Berlin. Drawings and animation for "What would you decide?" Script and concept for "What would you decide?"